Roasted winter squash makes life complete. 1. Roast winter squash with bell pepper, green onion, butter, garlic, and sage for 25-35 minutes at 350° until squash becomes tender-crisp. 2. Chop alligator sausage into small pieces, add to large pot, and cook at medium-high heat until lightly browned. 3. 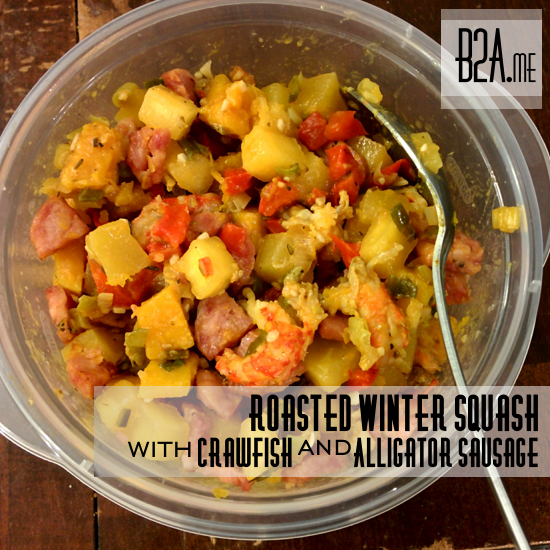 Add roasted winter squash and crawfish to pot with alligator sausage; add enough water to JUST coat the bottom of the pot; cover and cook for 10 minutes. For the last step, cook JUST long enough for the crawfish to become cooked. You have to watch those little things because if you cook 'em too long, they'll disappear!